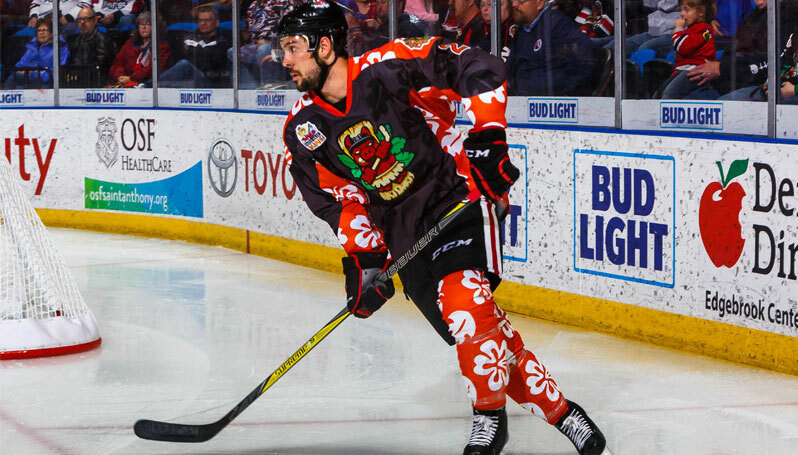 Auctions conclude April 10 at 9 p.m.
ROCKFORD, Ill. – The Rockford IceHogs today announced that three specialized jerseys from Saturday’s Hawaiian Night (presented by Insurance King) will be available for online bidding at the IceHogs’ eBay store beginning tonight (April 3) at 9 p.m. The IceHogs’ Hawaiian-themed jersey from the game on March 31 is gray with a black floral pattern adorning the torso, back and arms. The sweater also features a striking orange contrast along the shoulders, under the arms and around the wrists, and has the imprint of white hibiscus flowers throughout the design. The crest is a unique “Tiki Hammy” logo, which contains Hammy’s likeness wearing a hula skirt in front of a banana leaf background. Funds from the online auction will then be totaled along with the money raised during Saturday’s live jersey auction, with a portion of the combined proceeds benefitting Bryan & Amanda Bickell Foundation, National MS Society – Greater Illinois Chapter and several other local charities. Saturday’s jersey auction raised over $66,000. The IceHogs host their final home game of the 2017-18 regular season with an Illinois Lottery Cup series matchup against the Chicago Wolves. Friday is Fan Appreciation Night and the first 2,500 fans in attendance will receive a free copy of this season’s team photo, courtesy of American Solutions for Business. Tickets can be purchased at IceHogs.com, by calling (815) 968-5222 or in-person at the BMO Harris Bank Center Box Office.